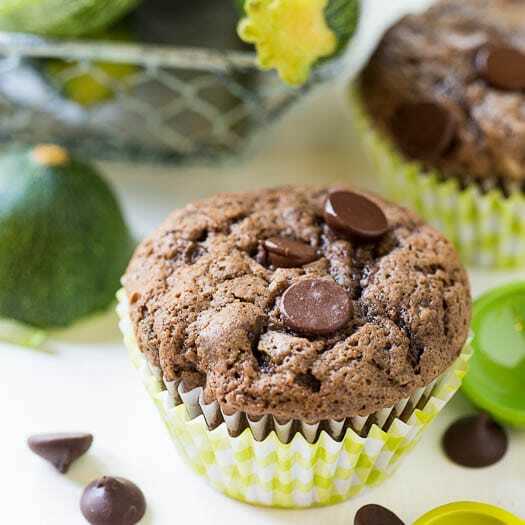 These moist zucchini muffins are loaded with dark chocolate and almost have the taste of a cupcake. Great way to sneak in some veggies. During the summer months I can’t help but come home from the farmers market with an armful of zucchini. Stacked so high on the tables, it’s practically calling out “Take me home”. Usually I just roast zucchini in the oven until it gets nicely browned and caramelized on the surfaces. It tastes like candy to me that way. But towards the end of summer I start looking for different ways to cook with it. 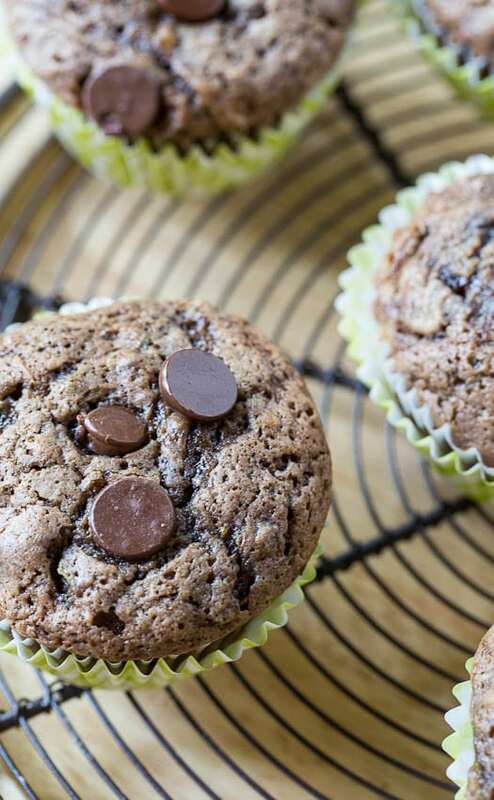 Adding zucchini to chocolate muffins is a great way to sneak some veggies in without your kids even realizing it. The flavor of zucchini is on the bland side, but it has a high moisture content. It helps prevent muffins from becoming dry without adding lots and lots of fat. The grated zucchini just kind of melts into the batter as it cooks and you hardly even know it is there. I’ve added some applesauce to the batter to really help cut down on fat. That means we get extra chocolate right? And with 2 types of dark chocolate in the batter and a handful of dark chocolate chips, these muffins are a chocolate lovers dream. 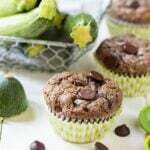 Super chocolatey zucchini muffins are a great way to sneak some vegetables in. Preheat oven to 350 degrees and line 18 muffin cups with liners. In a large bowl whisk eggs, both sugars, oil, and applesauce until smooth. Add in vanilla extract. Add in melted chocolate, adding slowly if it is still hot, and whisking continuously. In a medium bowl, combine flour, cocoa powder, salt, baking soda, and baking powder. Add flour mixture to egg/sugar mixture and stir just until combined. Pour batter into muffin cups, filling just below tops of liners. Bake 20 to 25 minutes. This entry was posted in Breads and Muffins and tagged chocolate, muffins, zucchini. Bookmark the permalink. Oh I love healthy muffin recipes!!! And this one has chocolate?!!! AMAZING!!!! Oh man I keep waiting for my bf to look at me with horror at coming home with even more zucchini. I just can’t help myself! If I sneak them into these gorgeous chocolate muffins though he’ll have no idea. 😉 They look fantastic, Christin! How beautiful these muffins are. I love zucchini in sweet treats. I made some too with cinnamon. Will have to try the chocolate ones too. These muffins are looking about 1000x better than the plain bowl of oatmeal I had for breakfast this morning. Seriously gorgeous, Christin! I’ve currently got a TON of zucchini growing in my veggie garden, and I know that very soon I’m gonna be overloaded with it. These muffins are going to the TOP of that must-make list. 😉 Pinned! Just walked in the door from the farmer’s market with one gigantic zucchini. It must weigh five pounds. Pinning! I always go hog wild over zucchini and summer squash in the summer, and I’m crazy about chocolate and zucchini together. It’s been too long since I made zucchini-chocolate bread, and looking at these is making my mouth water! 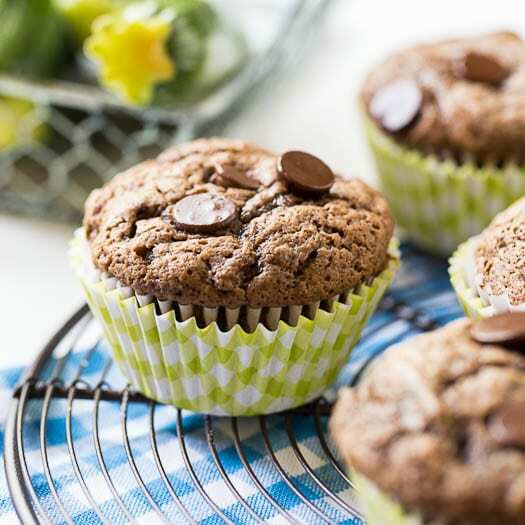 I made a chocolate zucchini bread last year and we loved it – these muffins look really delicious and so fluffy! I adore baking with zucchinis in summer! 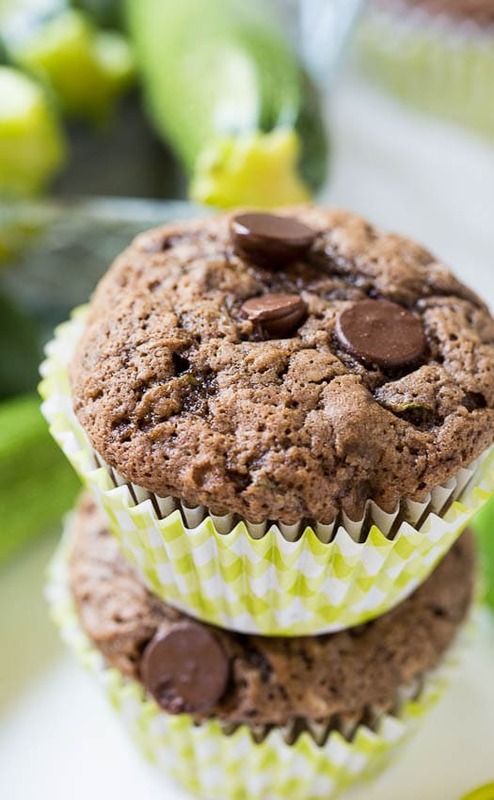 They’re growing like mad in our garden and I need lots of ideas to use them up, especially if said ideas involve huge amounts of chocolate 😉 I love this healthier twist on chocolate muffins. They look so moist and delicious!